It’s no secret that a dog is man’s best friend – philosopher Henry David Thoreau believed “it often happens that a man is more humanely related to a cat or a dog than to any human being.” Pets and seniors make a perfect match not only because pets encourage staying active and getting exercise, but also because they provide companionship and unconditional love to combat loneliness in aging. Dogs, cats, and many other furry, feathered or scaly friends can help the elderly fight feelings of isolation and enrich day-to-day living. 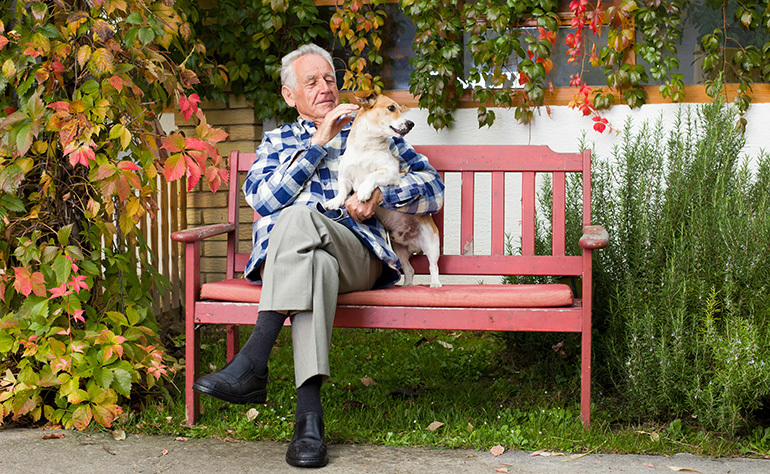 A growing number of Canadian seniors are recognizing and taking advantage of all the health and psychological benefits that come with owning and interacting with animals. St. John’s Ambulance has seen a spike in their community therapy dog program, which has grown to nearly 3,300 teams since the program’s start in 1992. Are you thinking about welcoming a new furry, feathered or scaly friend to live in your home? In addition to the classified section of newspapers, local pet stores and local animal shelters, there are websites dedicated to helping seniors in Canada find the perfect pet. Check out Elderdog.ca, a non-profit Canadian organization that matches Canadian seniors with elderly dogs who need homes, or Petfinder.com, which works internationally with animal shelters and helps people of all ages locate animals up for adoption. If you have concerns about not getting enough physical exercise, your mental health and wellness, or you want to enjoy a little companionship, owning a pet may be beneficial. It’s never too late to experience the unique bond that can be shared between humans and their animal companions! Do you or someone who visits your home regularly have allergies to pets? Is a member of your family afraid of dogs or other animals? If you have limited mobility or a dog sounds like it might be too much work, consider all of your options. Cats offer a great balance of companionship and low maintenance, or, consider adopting a small bird or guinea pig. With pets comes responsibilities, such as training, exercising, grooming, vet visits, clean-up, and other unexpected possibilities. Make sure you are prepared for the extra work a pet requires. Will you have enough time and energy to dedicate to your pet? Do you spend your time volunteering, or are you often out of the house? Your daily routine will be affected by pet ownership. Research about different breeds and their personalities to see which is most compatible with you and your lifestyle. Ask someone at your local pet store or veterinarian office for advice or pet suggestions. If you’d like to spend time with a pet without committing to owning one, consider finding an animal therapy service in your area. You could even be a DogVacay pet sitter and take care of local pets while their owners are away. Make a list of the advantages and disadvantages of owning a pet so you can be confident in your decision to make space for your new roommate. The most important thing to remember is not to rush the process of getting a pet; take your time and make sure you’re prepared with all the right items and resources for pet ownership. And remember, your Bayshore caregiver is always willing to assist with the day-to-day tasks that come along with gaining a furry friend.